Ludvig Rosenkrantz and Karen Mowatt’s little manor from the 1660s is surrounded by beautiful and historic grounds, including a Renaissance garden, a romantic landscape garden and the kitchen garden. From Rosendal Garden you get a grand view of the enveloping mountains Malmangernuten, melderskin and Laurdalstind, and of the waterfall Hattebergfossen and Hardangerfjorden. The garden has been built up over several hundred years of changing styles and fashions in gardening, Here you can experience more than 300 years of garden history. Ludvig Rosenkrantz and Karen Mowatt’s little manor from the 1660s is surrounded by beautiful and historic grounds, including a Renaissance garden, a romantic landscape garden and the kitchen garden. 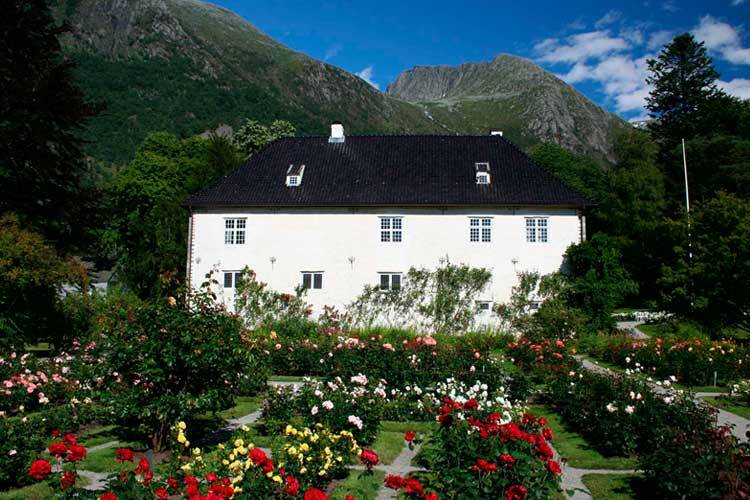 From Rosendal Garden you get a grand view of the enveloping mountains Malmangernuten, melderskin and Laurdalstind, and of the waterfall Hattebergfossen and Hardangerfjorden. The garden has been built up over several hundred years of changing styles and fashions in gardening, Here you can experience more than 300 years of garden history. From the first Snowdrops in January there are flowers and bushes in bloom most of the year. The spring is beautiful with fruit trees in bloom, tulips, daffodils and ascension lilies. 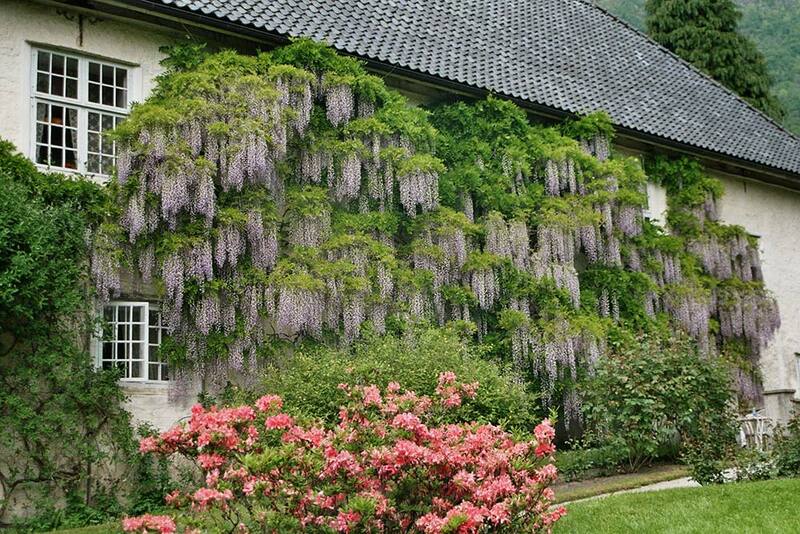 In early summer the Wisteria blooms and covers the southern wall of the manor with wonderful blue stems. I June bloom the rhododendron and asalea in many different colours. The roses bloom in full by July, and stay in bloom far into the autumn. 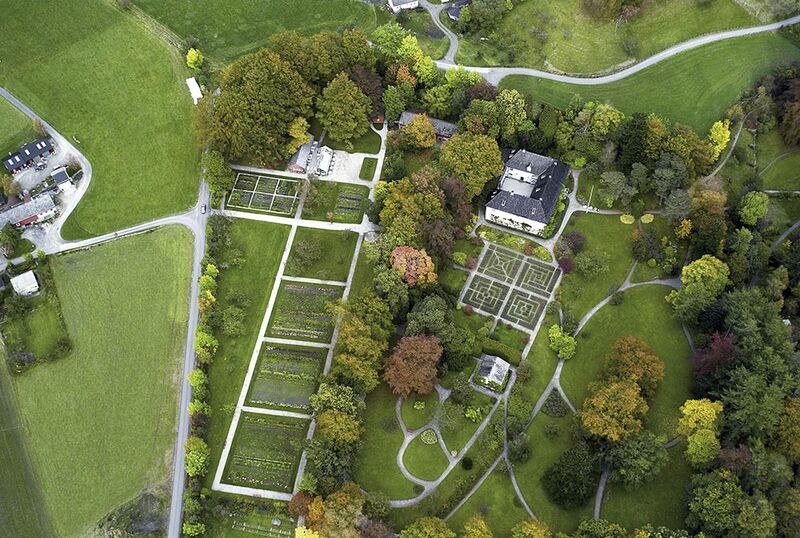 The Rose garden is limited westward by a 300 year old buksbom. It is a leftover from the old renaissance garden of Ludvig Rosenkrantz and Karen Mowatt. The wonderful rose garden (renaissance garden) with the whitewashed manor and the mountains in the background, is a beautiful sight for all the Manor’s guests to enjoy. The 60-acre gardens ranging from rose garden with parterre pattern from the Renaissance to the Victorian landscape garden from about 1850, and the newly renovated kitchen and herb garden. It’s nice to have a walk on your own in Rosendal Gardens, you may also get a guided tour (groups / pre-booking only on email info@baroniet.no). 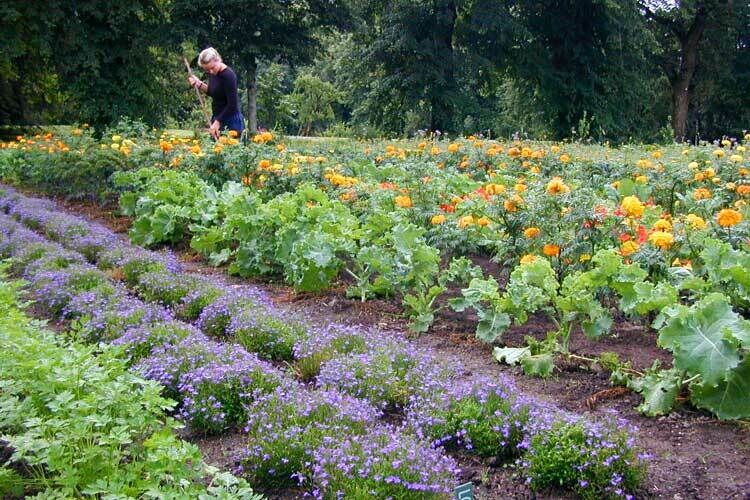 The newly restored kitchen and herb garden supplies the Manor with fresh produce throuchout the season. Fruits, berries, vegetables, salads and herbs are being harvested for creating lovely food in the Greenhouse and dinners at the Manor. The tennant farm Treo is today a part of the museum Baroniet Rosendal. Treo’s history can be traced back to 1840, when it used to be a tennants farm directly under the manor. 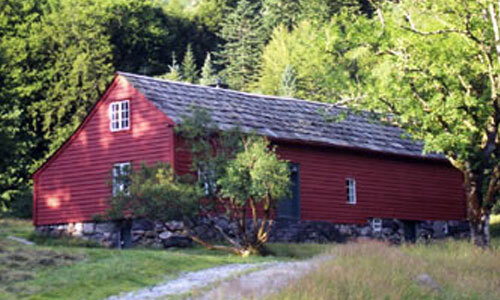 The farm is beautifully situated between the Landscape Garden and the waterfall Hattebergsfossen. Just a short walk from the manor. Treo combines different functions in one house; livingroom, farmhouse and henhouse. The tennant’s farm Treo gives an impression of everyday life with farm animals and activities, and has recently been restored to show it as it was when the last family lived in the 1930s. This was done out of a wish to show the life on a tennants farm and the socio-historic picture to the visitors. From the beech forest in the garden, there is a lovely view towards the Hatteberg waterfall. There is a path around the waterfall with an even closer view to the waterfall. From the Home Farm you just cross the bridge and follow the path along the other side of the river to the waterfall. Have a look at beautiful autum colors in the landscape park from the 1850s surrounding the Manor House from 1665.